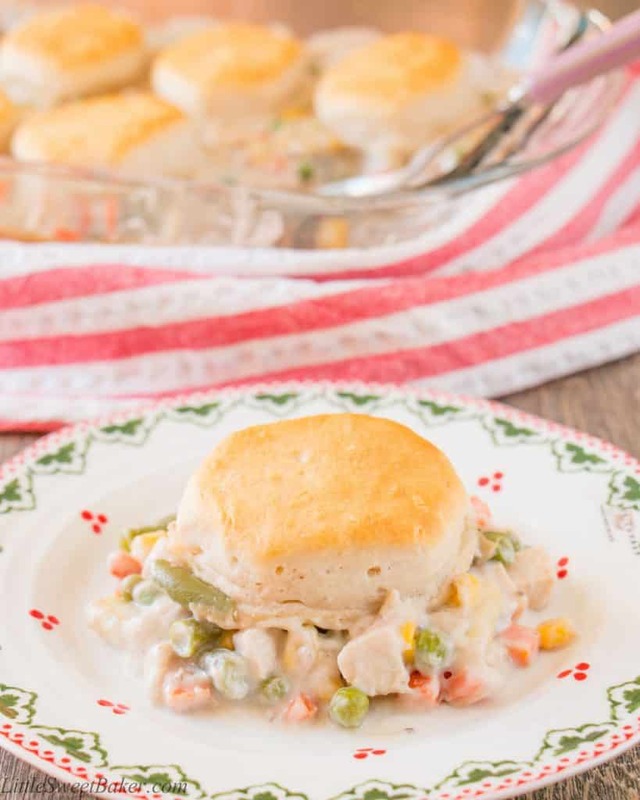 Turn this year’s leftover turkey into a scrumptious biscuit casserole. 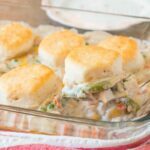 It’s filled with chunks of turkey and delicious vegetables in a creamy mushroom sauce, and it’s topped with soft fluffy biscuits. I hope everyone enjoyed their Thanksgiving dinner yesterday, and I’m assuming most of you are planning to do some shopping today. I’m envious of all the sales that are going on right now in the States, but I wish all of you who are venturing out there the best of luck in finding the bargains you are looking for. Once you get home from a crazy day of shopping, here’s a quick and satisfying meal you can prepare using your leftover turkey and vegetables from yesterday’s dinner. This recipe starts with some cream of mushroom soup, mixed with some milk and flour. Bake that along with your leftover turkey and veggies. 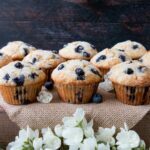 Then you top it with some refrigerated biscuits, bake again until golden, and you have a delicious and comforting meal to sit down to. If you don’t like cream of mushroom soup, feel free to substitute it with any kind of cream soup you prefer like cream of chicken or cream of broccoli. You can also use frozen vegetables if you don’t have any suitable leftover vegetables. 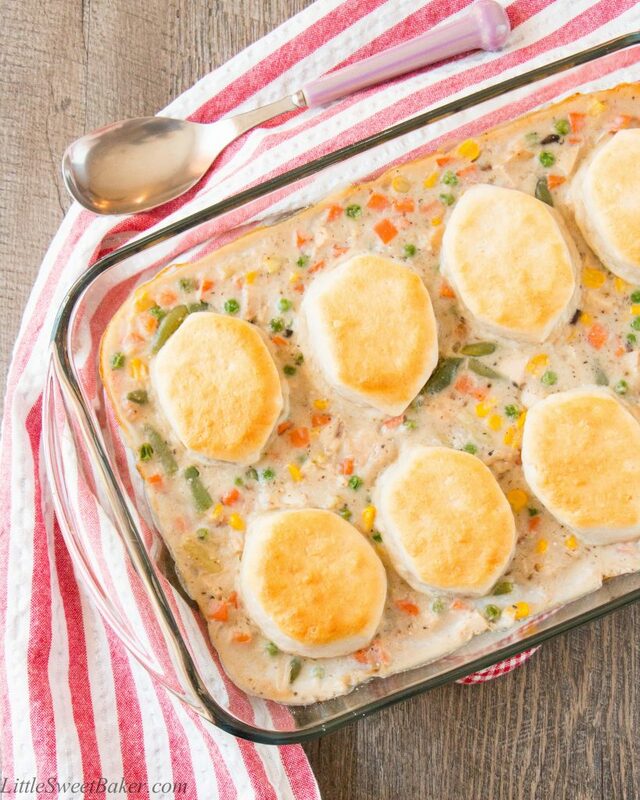 This casserole is a cross between a pot pie and a cobbler. The filling is loaded with chunks of meat and veggies coated in a thick creamy mushroom sauce. The biscuits are soft, fluffy and warm. 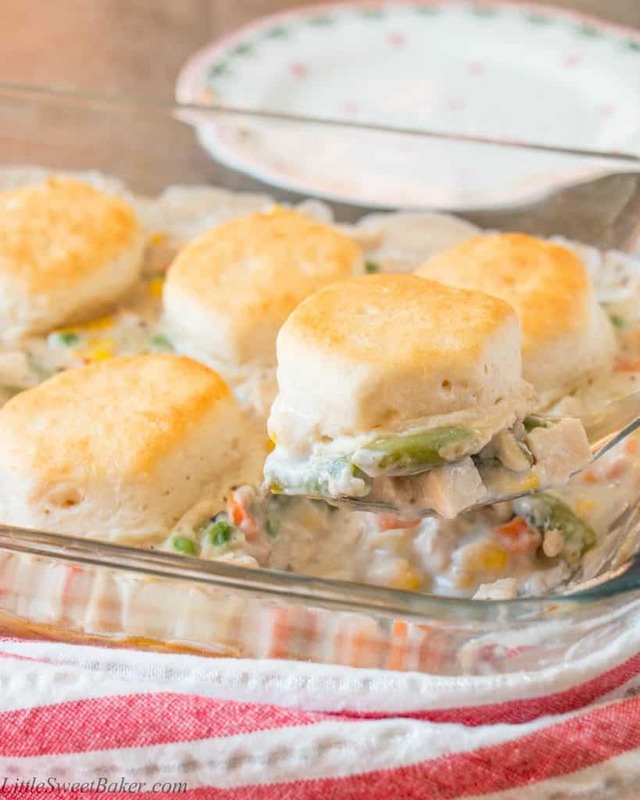 It’s topped with just enough biscuits to make this dish satisfying and hearty. 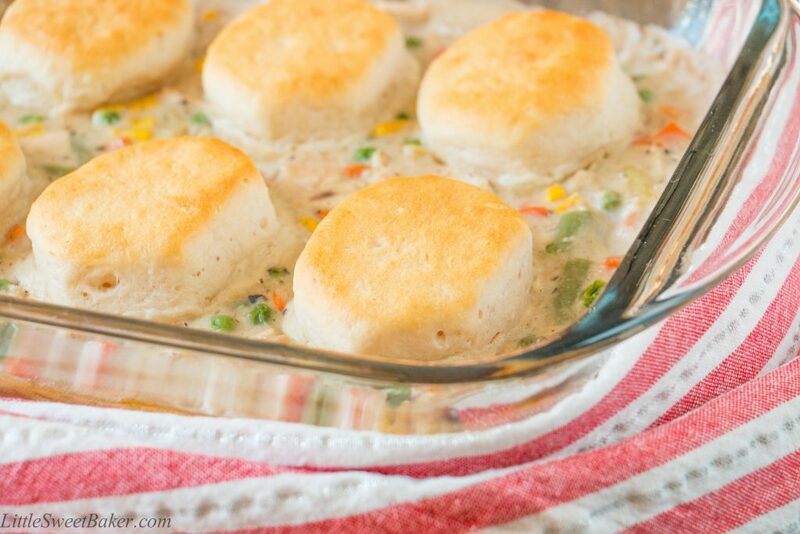 This leftover turkey casserole is filled with chunks of turkey and delicious vegetables in a creamy mushroom sauce, and it’s topped with soft fluffy biscuits. In a large bowl, whisk together the condensed soup, milk and flour. Stir in the meat and veggies and season with salt and pepper. 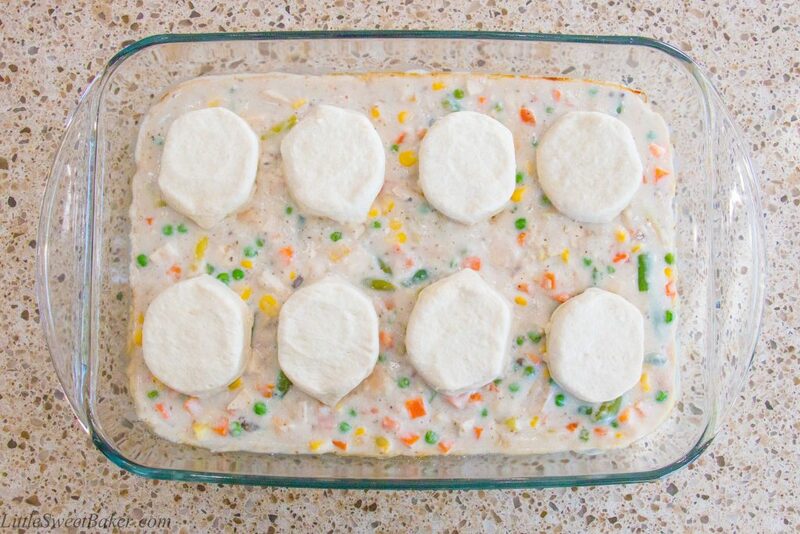 Pour the mixture into the baking dish and bake for 20 minutes. Remove the dish from the oven and top with raw biscuits. Continue baking for another 10-12 minutes or until the biscuits are golden and the filling is bubbling. 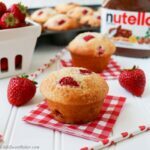 I’ll be sharing this at Fiesta Friday #147 hosted by Angie, co-hosted by Julianna @ Foodie On Board and Hilda @ Along The Grapevine.